At auction is a huge replica of Thorin’s contract for Bilbo Baggins’ employment as Burglar for the Company of Dwarves on their Quest to The Lonely Mountain as it appeared in Peter Jackson’s movie The Hobbit: An Unexpected Journey. TheOneRing.net threw a magnificent party as we were joined by film celebrities, Tolkien artists, authors and many more to celebrate the 2012 Oscars on February 24, 2013 while The Academy Awards took place just around the corner in Los Angeles, California. This contract was signed by attendees at that party, including artists Donato Giancola and Tim Kirk, Celtic band Emerald Rose, and many others. 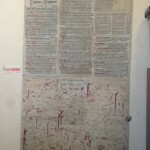 Here’s your chance to own a piece of TORn and Cinema history… not to mention a very easy-to-read copy of Bilbo’s Contract! This replica can be kept intact in one large piece if it’s picked up in person in Los Angeles, California. However, because of the size and dense mounting board this Contract is affixed to, the Contract will be divided into 12-inch sections for the most manageable and economic shipping cost possible. Size: 44 x 72 inch foam-core mounted reproduction. 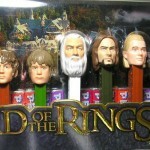 This limited edition Lord of the Rings Pez Gift Set comes with 8 themed dispensers and 12 rolls of candy.The dispensers are Bilbo Baggins, Frodo Baggins, Samwise Gamgee, Gandalf, Aragorn, Legolas, Gimli, and Gollum. Item is brand-new, unused, unopened and undamaged. 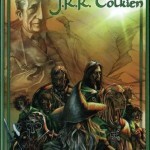 This guide to J.R.R.Tolkien is an exploration of Tolkien’s world from the writers of the Tolkien fan website, TheOneRing.net. This volume includes new articles as well as familiar favourites from the website. The essays are grouped around themes such as defending fantasy literature from the accusation of triviality; why people become Tolkien “fans”; whether Tolkien’s notions of Good, Evil and Free Will are relevant to a changing world; the inspiration fans draw from his work; and the ideas from which Tolkien himself drew inspiration, both in his life and in his love of ancient literature and European myths. This volume also looks at the impact of the wildly popular cinematic version and answers the most common questions asked about Middle-earth.